This page displays the professional and personal biography for Bethany Abrahamson, a tarot reader and numerology consultant living in Appleton Wisconsin USA, and the owner of InTheKnow Tarot LLC. Thanks to my mother, I was born into the world of tarot, quite literally. In the 1970s, before the age of home pregnancy tests, my mother decided to do a tarot reading to see if the cards indicated anything about having a baby. Her outcome card was The Empress, a card commonly associated with motherhood and pregnancy. Less than a month later, her doctor confirmed she was expecting! Yes, that baby-on-the-way was me. My father was a spiritual seeker, explorer, and an informal scholar. He could have become a professor of religious studies, if only he had felt inclined to teach. His "second mother" was a spiritualist minister, so he read about just about every religion and spiritual practice under the sun. Between my father's impressive metaphysical mental library, and my mother's natural inborn intuitive talents, I always had an interest in the nature of spirituality and its role in divining information to help others. In 1992 I was introduced to the late Ken Nelson, a nationally respected numerologist and handwriting analyst from Milwaukee. Thanks to his guidance and mentorship, I learned how to build numerology charts and do in-depth analysis for clients. Numerology became a critical tool for me, and I've used it to help many people understand themselves and their loved ones better, and also to assist people in their planning. Then in 1996, I purchased my very first tarot deck, and I started doing readings for myself and my friends. Although I was initially startled (and a little frightened) by it's accuracy, I found I couldn't put my deck down for long. In 2000, I stepped into the world of doing professional readings, thanks to the generous and talented Deborah Lighthart (http://www.thehealingcommunity.org/p/deborah-lighthart.html). Through her, I was able to dabble a bit in the realm of professional readings, reading for corporate clients at their businesses events, which were held at places such as the Hilton Milwaukee Downtown and the Milwaukee Zoo, as well as smaller private parties. I also performed a number of phone readings. Years later, I moved to the Appleton area, and I chose to return to a more conventional, corporate work environment. Although I kept doing readings for friends and the occasional referral, I dismissed my dabbling with professional readings as over. Truth be told, I was just scared. Then, one day, I screwed my courage to the sticking place and stepped back into the arena. I left the corporate world behind for good, and performed readings at a local bookstore for four years. The next chapter has brought me into the world of formally establishing my own business, and being my own boss. Huge thanks to the phenomenal Theresa Reed (aka The Tarot Lady http://thetarotlady.com/) for relentlessly pushing me and cheering me on to take this step! These days, my second career was formerly my first one. I was a voice performance major during my University years. Since then I've been fortunate to sing with a professional operatic chorus, perform in theater alongside members of the Actors' Equity Association, work as a music engraver for a large music publishing company, as well as compose and arrange original songs for local productions. From 2013-2018 I had the joy and privilege of conducting two marvelous choirs in my community. I currently work part-time teaching voice lessons at the Lawrence University Academy of Music. In my spare time, I love to whisk myself away to many of Wisconsin's fantastic state parks, relax near open water (I'm a Cancer, through and through), create music, and perform in the occasional play. I also admit to watching far too many cat videos online. Being in Northern Wisconsin is where I'm happiest these days. From my college summers in Door County, to visiting family in Minocqua, Wausau, Lac du Flambeau, and Bayfield throughout my lifetime, my love of the Wisconsin Northwoods runs deep, and it's where I turn to cleanse my mind and spirit (thank you, Sagittarius Rising). Spending quiet time in the wild is a major cornerstone of my spirituality, and in maintaining my overall well-being. My interests are varied, some of which include medieval European history and music, international cuisine, world music, traveling, cultural exploration, the evolution of world languages, hiking, and swimming in large natural bodies of water, just to name a few. 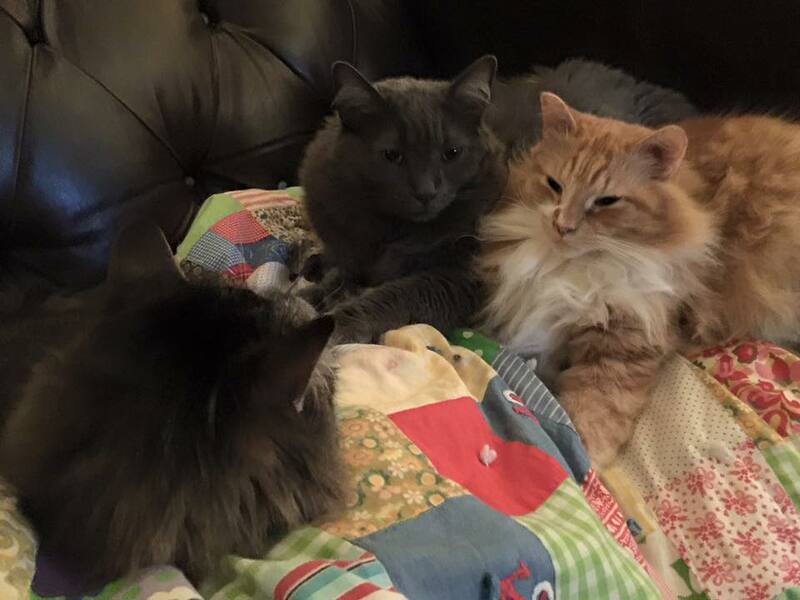 I share my home with four furry cats (including a new kitten! ), two furry dogs, and one absolutely phenomenal husband.